"Our task must be to free ourselves by widening our circle of compassion to embrace all living creatures and the whole of nature in its beauty." The land grant of the lots which have become The Braes was not made until 1882. We do know that settlement in the mountains was not encouraged for many years. While the early explorers did not record meeting many tribespeople, bark huts were found on the tops of ridges and there are cave paintings throughout the Blue Mountains. These could have been from the Gandangara people or from the Daruk tribes of the coastal plain. The road to Hartley had been pushed through by William Cox by 1815 but it was designed to assist in the settlement of the fertile plains beyond the mountains. In the 1850s, the discovery of gold triggered a huge exodus from Sydney to places like Hill End and Sofala where cities of tents sprang up and Cobb and Co plied between the city and the bush. This was the era of bushrangers, mounted police and the romance and tragedy of the Gold Rush. By the 1870s, the area was more known for the coal mines in the valleys. The railway opened in 1874 when the stop where Katoomba now stands was known as The Crushers because the ballast on which the line was laid was crushed there. The tent school was opened in 1881, moving soon into a wooden building to allow the children to escape the winter cold. In 1882, the Great Western Hotel, which was to become the famous Carrington Hotel opened for business. The Blue Mountains was starting to become a holiday destination. At that time, the area was sparsely settled, servicing the many travellers and transporters between Bathurst and Sydney. Down in the valley below Leura and on the way to the huge escarpment, The Braes was host to native animals and perhaps some intrepid walkers. The site and the adjacent block to the west were used for many years prior to the Second World War for market gardening purposes supplying the local community. The site itself was part of a dairy farm. The neighbouring property to the west, Lot 33, was used for many years after the Second World War by the Knight family as a "market garden". Aerial photos reveal that in the early 1930s the area was open grazing land and the original part of the existing weatherboard cottage was on the site. By 1947 the early phase of a designed landscape pattern is clearly evident. The early stages of the existing Western Red Cedars and recently removed Chamaecyparis lawsoniana can also be discerned. In the mid to late 1940s, the then owner, Dr Geoffrey Hagarty, was given advice on the design concept for the garden by Paul Sorensen and some of the characteristic dry-stone walls were built at that time. Many of the cold climate trees such as the cedars and variegated elms were planted then as well. The aerial photographs show that the stands of radiata pines were well established by the 1950s. The environmental degradation was caused by the close planting of these trees to gardens and paths. A later owner ( in the late 1970s and early 1980s) was Grahame Linkenbagh who developed the ponds in the north-south flowing creek,. Mr Linkenbagh also constructed some stone pathways and steps in both the east and south-facing garden areas. Then followed a long period in which the property was not adequately maintained. Weed infestation was heavy and pervasive, trees were neglected, pollution cluttered the creeks and roots forced up parts of the paths making them unsafe. The dry stone walls were allowed to deteriorate and stone pathways became unsafe due to poorly maintained drainage. John Egan acquired The Braes in April 1996. 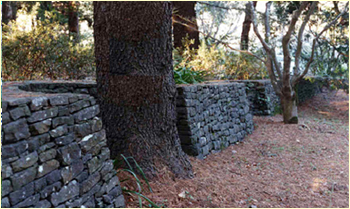 The first task was to observe all seasons on the property, and the impact of urban runoff, and learn a little of the functioning of the long-established garden irrigation and other facilities in place, the safety of the dry stone wall structures and pathways, and the quality of existing structures, including dams, and site erosion, particularly creek banks. This observation took until the end of 1996, at which stage he appointed an arborist and a horticulturist to work on the remediation of the garden, including dead-wooding of trees which had not been dead-wooded, it appeared, for over 20 years. Deadwooding ensures that the trees stay in a healthy state. This maintenance procedure was applied to various cedars, elms and oaks. For the horticulturist, in addition to garden restoration, there was a significant amount of work associated with the eradication of noxious and environmental weeds. Plans were formulated for the progressive repair and remediation of the heritage section of the garden environs and the establishment of complementary gardens on the adjacent land. From that time, work has continued on weeding, propagation, planting, repairs, dead-wooding and pruning. Qualified horticulturalists and arborists have been engaged to ensure that the work meets the highest standards.